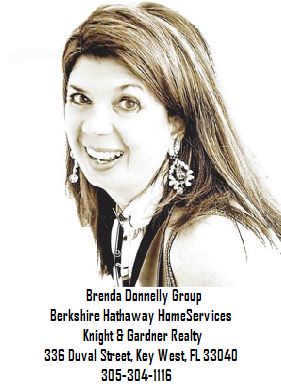 Brenda Donnelly Group, Island Homes Key West | Berkshire Hathaway | Serving your real estate needs in Key West. Whether you want to spend a week in Key West, a month or a lifetime, Realtor Brenda Donnelly and The Donnelly Group will help you navigate the single family and commercial Key West real estate markets. Brenda Donnelly, the 2017-18 Key West Realtor of the Year, is an experienced Key West real estate agent and long-time resident. She brings more than two decades of experience to your search for the perfect single-family home, vacation rental or commercial property. Brenda is a Luxury Collection Specialist for Berkshire Hathaway Home Services Knight & Gardner Realty, putting her among the most elite of real estate professionals. The Donnelly Group can assist you in all aspects of buying or selling a home in Key West. Historic Key West Vacation Rentals, manages high-end vacation homes for many of her real estate clients. Being able to find and manage your vacation home with clarity and ease. Brenda specializes in elegant single-family residences, superior second homes and commercially exceptional vacation investment properties. Brenda brokered the sale of our Key West Florida house. We were extremely satisfied with her knowledge of the market and the “beyond the call of duty” steps she took which lead to a successful sale. Irwin & Gary: Sold a Single Family home in Historic Seaport, Key West, FL. Jeff: Sold a Single Family home in Midtown, Key West, FL. Matt & Ricky: Bought a Single Family home in White Street Gallery District, Key West, FL. user6422768 Bought a Single Family home in White Street Gallery District, Key West, FL. Brenda Donnelly and her team are second to none when it comes to Key West real estate! My expectations were exceeded every step of the way — and the process is long — as Brenda and her team kept my best interest at heart. Brenda’s keen knowledge of the housing inventory (past and present) was critical in the process. Even post closing, Brenda continues to impress us with her connections and recommendations. user5069866 Bought a Single Family home in Old Town, Key West, FL. Jill & Mindy: Bought a Single Family home at the Golf Club in Key West, FL. Brenda was incredibly professional and personable. She had an excellent grasp of the market and found us our Key West dream home where other agents had failed us. And when the sale hit some bumps as often happens when buying real estate, Brenda went above and beyond to make everything right and ensure we got our home! Heather: Bought a Single Family home in Bahama Village, Key West, FL. Bill: Bought a Single Family home in Key West, FL. Brenda was invaluable to the home buying process. She was responsive, knowledgeable, and accessible. Not being from the area, but knowing that I wanted a home with specific criteria, Brenda was able to guide us to the right neighborhood for what we wanted. She kept us informed throughout the process which resulted in us finding the perfect house! Thomas: Bought a Single Family home in Casa Marina, Key West, FL. Euclid: Bought and sold a Single Family home in Key West, FL.